Colorectal cancer is among one of the most preventable cancers, with AICR estimating that half of US cases can be prevented with diet, physical activity, and staying a healthy weight. But for individuals who do develop colorectal cancer, research suggests many ways a healthy lifestyle may help. Now, two recent studies are adding to emerging research on the role of diet and exercise habits both before and after a colorectal cancer diagnosis. Following AICR recommendations for cancer prevention before a diagnosis – eating high amounts of plant foods, keeping to a healthy weight and being active, to name a few – link to an improved likelihood of prolonged survival among people diagnosed with colorectal cancer, suggests one large study. The findings, published in the journal BMC Medicine, found that each recommendation followed reduces the risk of mortality to some degree. In this study, researchers analyzed data of participants from 10 countries in the European Prospective Investigation into Cancer and Nutrition (EPIC) cohort. When participants joined the study they answered questions about their medical history, diet and lifestyle. Weight and height measurements were also taken. After an average of 6.4 years, 3,292 of the participants were diagnosed with colorectal cancer. Four years after diagnosis, survivors who had most adhered to AICR recommendations in the years before diagnosis were 30 percent less likely to die from colorectal cancer, and 21 percent less likely to die at all compared to those who least followed the recommendations. The higher the score, the lower the risk of mortality after bowel cancer. Every one point increment linked to a 10 percent lower risk of dying from colorectal cancer, and a 7 percent lower risk from dying from any cause. When the individual recommendations were studied, it was found that having a healthy weight and high plant foods consumption had the strongest associations with survival. Lifestyle was measured only once before diagnosis so it is not possible to know if lifestyle habits changed during follow-up or after cancer diagnosis, note the authors. If possible, be aerobically active at least 150 minutes per week. Every bout of 10 minute activity counts toward that goal. Aim to be as physically active as possible. Perform muscle strengthening exercises two or more days per week. Minimize sedentary behaviors, such as watching television. If you are watching TV or doing other sedentary behaviors, take frequent breaks. Don’t consume sugar-sweetened beverages, including sodas, sports drinks and fruit or vegetable juices. *Source: Van Blarigan EL, Meyerhardt JA. Role of Physical Activity and Diet After Colorectal Cancer Diagnosis. Research investigating how lifestyle after a colorectal cancer diagnosis affects survival is sparser, yet this is a time when survivors can alter their diet and activity habits, notes the authors of the second paper. Here, the evidence on physical activity appears most clear. After diagnosed with colorectal cancer, being physically active appears to lengthen survival time, according to the paper published in the Journal of Clinical Oncology last month. One analysis of studies that included approximately 7,500 colorectal cancer survivors, the more active people were, the lower their risk of dying from both colorectal cancer or any cause. Increments of 15 MET/hours per week – walking about five hours a week – linked to a 38% lower risk of dying from any cause, and about that same lower risk as dying from colorectal cancer. “The key for survivors is to undergo standard of care treatments (surgery, chemotherapy when recommended, radiation when recommended) since diet and lifestyle are principally studied as adjuncts to standard treatments and not replacements," says Jeffrey A. Meyerhardt, MD, MPH, at Dana–Farber Cancer Institute, co-author of the study. "After standard of care, the most consistent data are for exercise on a regular basis, trying to achieve goal of 150 minutes of exercise weekly but any level is probably better than inactivity." Trials consistently report that physical activity and or structured exercise are safe and feasible for patients with colorectal cancer, both during and after treatment. “As with any exercise recommendation, an individual patient should discuss exercise risks for their own situation, however,” adds Meyerhardt, who is also an advisor on AICR's CancerResource, a toolkit for survivors during and after treatment. Data for diet have mainly come from two large US cohorts, with more studies needed to understand what foods and dietary patterns consistently help survivors, the review concludes. And in many studies diet did appear to improve outcomes. In one study, for example, those who most followed a Western diet that included red and processed meats, desserts, refined grains had a nearly three-fold increase in recurrence compared to those who least followed this dietary pattern. Patients should consider a well balanced and healthy diet consistent with the overall US diet recommendations since survivors are at risk for other diseases that those diet recommendations are made (including high cholesterol, cardiovascular disease, diabetes). An estimated 40 percent of colorectal cancer patients have another serious health condition, such as type 2 diabetes or congestive heart failure. Healthy eating, along with exercise, are recognized for improving outcomes of these conditions. For now, the review authors conclude, patients follow a set of guidelines (see box), which take AICR Recommendations for Cancer Prevention into account. AICR recommends survivors of colorectal cancer – and other cancers – aim to follow the recommendations for prevention. 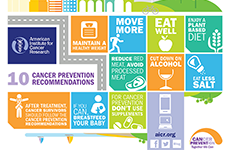 AICR recommends survivors follow AICR's Recommendations for Cancer Prevention. You can read more about those here. Van Blarigan EL, Meyerhardt JA. Role of Physical Activity and Diet After Colorectal Cancer Diagnosis. J Clin Oncol. 2015 Apr 27.